The Waco Downtown Farmers Market moves to the McLennan County Courthouse parking lot Saturday as work starts on the market's riverfront home. The farmer's market is expected to return to the riverfront in 2019. The market’s lineup includes fresh fruit. REMINDER: The market has moved. Click here to read about it. 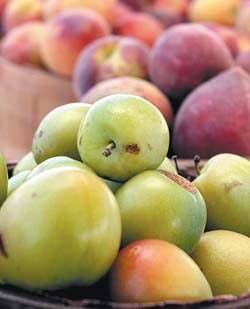 Waco Downtown Farmers Market, 9 a.m.-1 p.m. Saturdays at 510 Washington Avenue, across the street from the McLennan County Courthouse. The market is also held Tuesdays in the spring and fall from 3 p.m. to 7 p.m. Shoppers can find fresh greens, plants, artisan breads and cheeses, free-range eggs, brick-oven baked pizzas, coffee, sweet and savory crepe concoctions, jars of preserves, goat milk soaps, organic items, gluten-free fare and more.